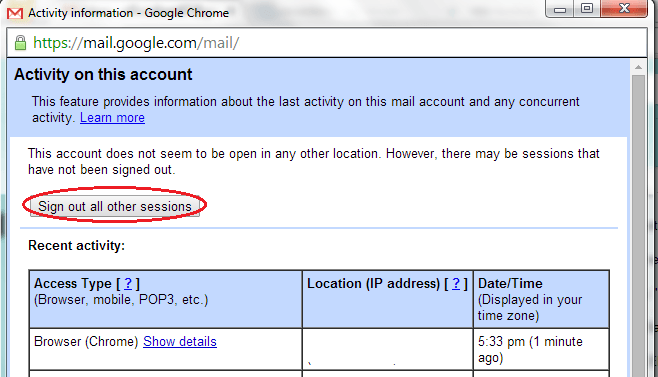 Gmail offers the easiest way to remotely log out of any active sessions. Log into your account and scroll down to the very bottom of your inbox. In the bottom left corner Gmail tells you when you were last active and just below it is a Details link. Click it and a new window opens with complete details of your active Gmail sessions. Not only can you see when and where (which country) you’re logged in from, but also which device. At the top is a ‘Sign out all other sessions’ button; click it and you will be signed out of every web browser that you’re logged into.